Superiority is a concept closely associated to that of power, superiority is definitely an essence of power. Main characters in history and nowadays are huge whales. In the animal world, because of their size, whales have an intrinsic and undisputed superiority. But Whales are also peaceful. They slowly and majestically move into cold waters, as strong epitomes of wisdom and prominence. 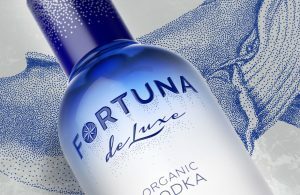 The intent behind Fortuna Deluxe is to create a both first-class and attractive image for this beverage, a presence full of dignity and appealing to its aficionados, who too calmly and confidently move through their life and reach the goals. The bottle’s general style involves a starry sky, visual elements illustrated with puantel technique. Stars stand are a symbol for success and achievements, a powerful message to translate Fortuna de Luxe’s spirit. The background colors complete this image of an underwater world – with a bottle made of glass treated with the impressive matt gradient technology. Fortuna de Luxe is a brand with a social message: whales don’t have an internal hierarchy, they care about each other and are protected by common efforts. That is why the project was completed by a sponsoring plan, since part of the sales revenue will be donated to wild life and nature protection associations.